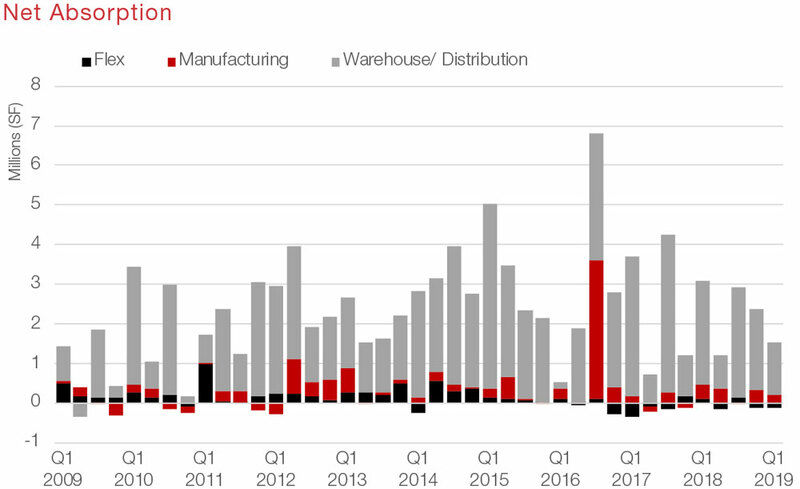 Houston’s overall industrial vacancy rate ended Q1 2019 at 5.9%, up 30 basis points quarter-over-quarter, and an increase of 80 basis points year-over-year. Net absorption was 1.4 million sq. 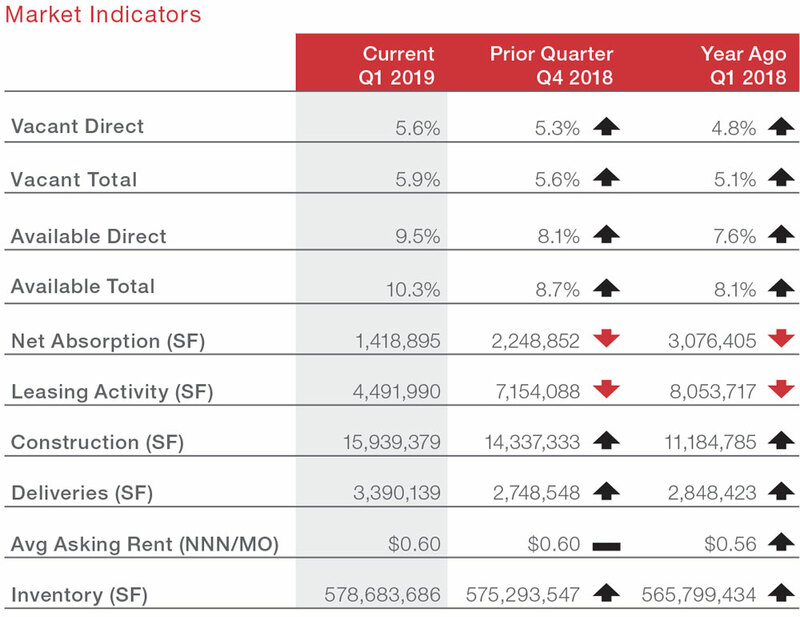 ft. for the first quarter of 2019, down 44.2% over the prior year’s 3.1 million sq. ft. New construction delivered during the first quarter stood at 3.4 million sq. ft.—up from the fourth quarter’s 2.7 million sq. ft. There is currently a record-breaking 16 million sq. ft. under construction, with the lion’s share in the Southeast (5.8 million sq. ft.) and North (5.4 million sq. ft.). Triple net average monthly asking rents remained at $0.60 per sq. ft. quarter-over-quarter, and up 7.1% from $0.56 year-over-year. Metro Houston created 72,600 jobs, a 2.4% increase, in the 12 months ending February 2019, compared to 56,400 jobs created in the 12 months ending February 2018, a 1.9% increase, according to the Texas Workforce Commission. The three sectors adding the most jobs over the past 12 months were durable goods manufacturing (15,200); professional, scientific and technical services (12,800); and health care (10,300). In energy, exploration and production lost 300 jobs while oil field services added 3,600. Energy prices recovered over the first quarter from year-end 2018. 2019 began with West Texas Intermediate trading at $46.31 a barrel, trending up through Q1 2019, and closing on the last day of March at $60.19 per barrel, a 30.0% increase. While oil prices recovered, Baker Hughes reports that the U.S. rig count peaked at 1,083 the last week of December and trended down in the first quarter of 2019. The rig count typically responds to fluctuations in monthly oil prices with a three-month delay. At the end of the first week in April, the rig count was at 1,025. Softness in the rig count suggests less work for oil field service firms now and slower U.S. production growth in the future. The unemployment rate in Houston was 4.1% in February, compared to the rates in both Texas and the United States at 3.8%. 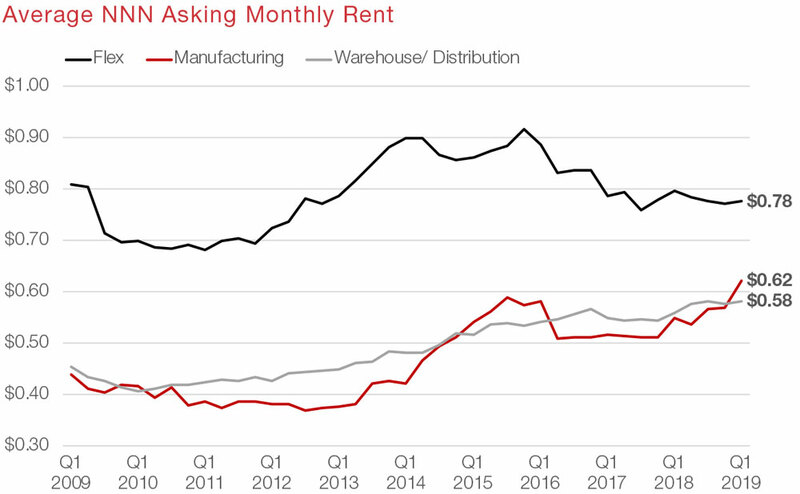 The vacancy rate for industrial space in the Houston metro has remained below 6.0% for 30 consecutive quarters, or Q4 2011. 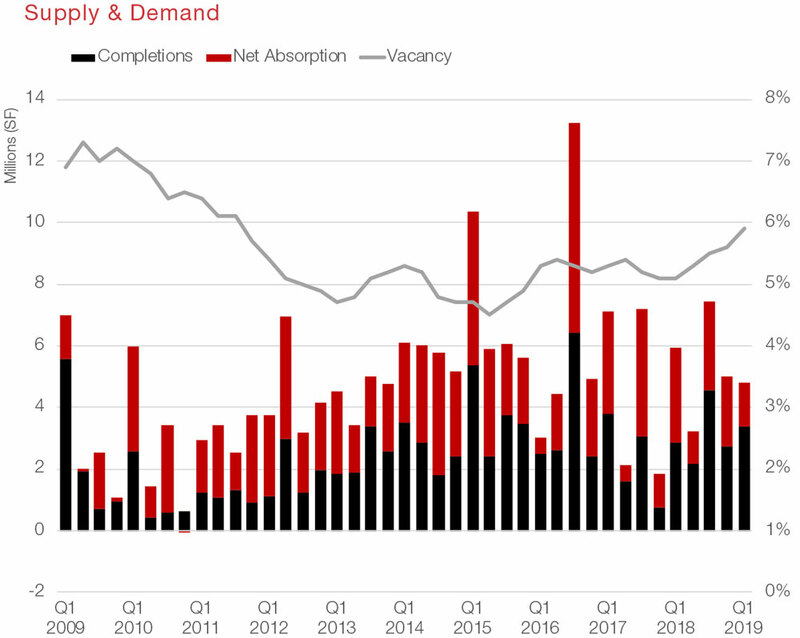 The record-breaking levels of new construction have been pushing the vacancy rate up slightly, ending Q1 2019 at 5.9%, up 30 basis points quarter-over-quarter, and an increase of 80 basis points year-over-year. There is no denying the demand for Houston industrial properties from ecommerce and distribution services combined with strong speculative development. In the last five years over 64.5 million sq. ft. has been delivered, expanding the Houston industrial market by 11.8%. There are 110 industrial projects covering 15.9 million sq. ft. of space under construction in the Greater Houston area—more square footage than at any other time in the metro’s history, exceeding the record of 15.4 million sq. ft. as of Q2 2015. Adding to current development is an upcoming project, an 833,700-sq.-ft. logistics complex to be built on a 60-acre site in the Northwest submarket. The project, called Sam Houston Distribution Center, is off Fairbanks North Houston Road between Fallbrook Drive and Taub Road just south of Sam Houston Race Park. The center will include three Class A buildings and is expected to be completed in 2020. Is Houston’s industrial market overbuilt? Low vacancy rates and strong net absorption have supported the industrial sector in Houston. In 2018 Houston absorbed 9.5 million sq. ft. of industrial space, just over the 2017 total of 9.1 million. With West Texas Intermediate at $61.59 per barrel at the end of the first week in April, the industrial market anticipates continued demand for manufacturing and warehouse space. The price of oil and gas directly affects the manufacturing sector of industrial real estate. When the oil and gas prices are higher, the demand for equipment and components increase, and when they increase their output, they typically need more space. The other demand driver—the explosion of ecommerce at full speed ahead. Online shopping led by Amazon hit a new landmark in February. The total market share of online U.S. retail sales was higher than general merchandise sales for the first time in history, according to a report from the Commerce Department. Of the total 16 million sq. ft. under construction, warehouse/distribution space accounts for 14.7 million sq. ft. (92.2%) and manufacturing space tallies 1.1 million sq. ft. (7.1%). Only 113,000 sq. ft. of flex space is underway. 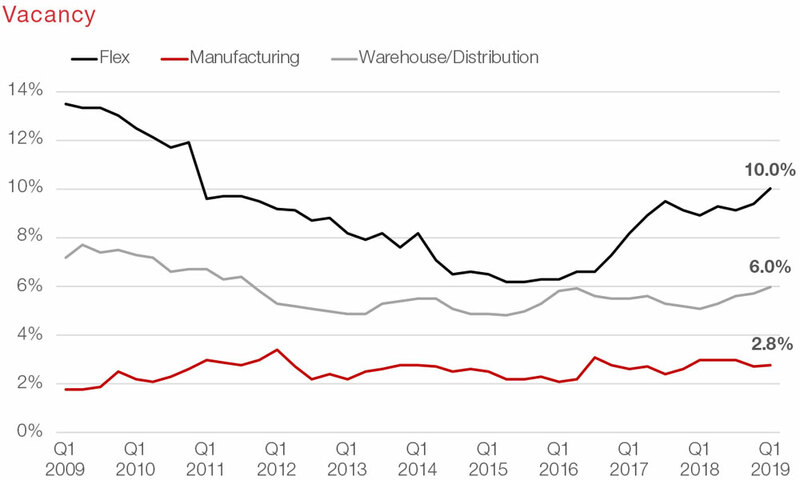 Barring any unforeseen event, a healthy industrial market is in the foreseeable future. In a March press release from Port Houston, preliminary results of the Houston Ship Channel Economic Impact Study report that the economic impact to the Houston Ship Channel region is $339 billion in state economic value, up 28% from four years ago. In addition, more than 1.35 million jobs statewide are impacted by Port Houston, a 15% increase from four years ago. Port Houston February overall cargo performance reported total tonnage of 6.5 million tons, and 413,000 TEUs, both up 6% for the year. Steel was up 44% for the year at 755,000 tons. 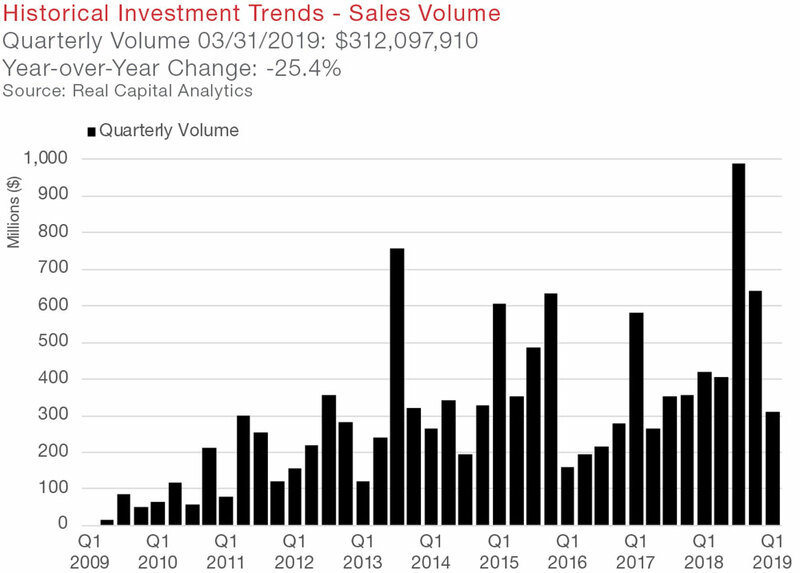 Real Capital Analytics data reports year-to-date industrial sales volume for Q1 2019 in the Greater Houston area at $312.1 million, compared to first quarter 2018 at 418.4 million, resulting in a year-over-year quarterly volume change of -25.4%. The primary capital composition for buyers in the first quarter was made up of 55.5% private, and 33.0% cross-border. For sellers, the majority was 42.2% private, and 33.0% cross-border. In March Riverbend Properties sold nine industrial properties – 185,400-sq.-ft. portfolio – Airport Commerce Park at 15100 Lee Road in Humble, to Redhorn Capital for an undisclosed price. The warehouse properties tenants included G&S Trolling Motors, L A Express, and Houston Fire & Security at the time of sale. The volume of square footage signed during the first quarter was down 37.2% at 4.5 million sq. ft.—compared to the previous quarter’s 7.2 million sq. ft.—and down 44.2% (8.1 million sq. ft.) from this time last year, although ecommerce and logistics activity continue to be robust in Houston. 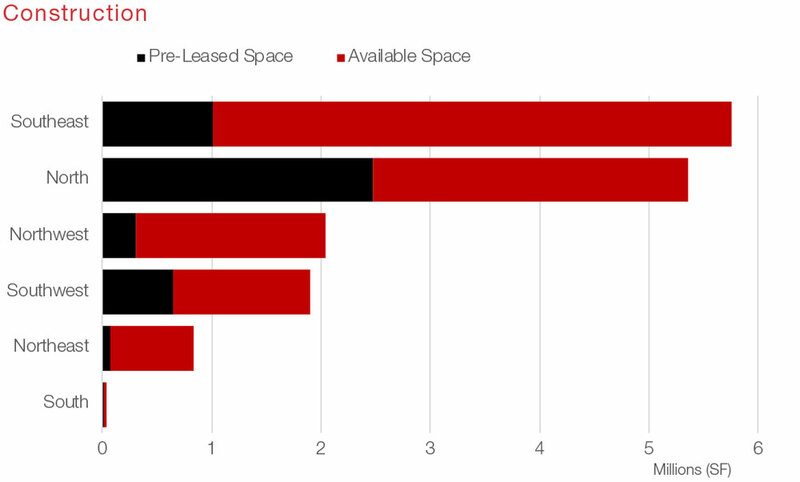 A few of the metro’s largest leases during Q1 2019 include Home Depot (770,640 sq. ft.) at the planned Grand National Business Park, Plantgistix (337,040 sq. ft.) at AmeriPort Industrial Park, Norlyn Enterprises (134,897 sq. ft.) at Fallbrook Pines Business Park, Marmedsa USA (125,120 sq. ft.) at World Houston Business Center, and Aztec Events & Tents (195,951 sq. ft.). Triple net average monthly asking rents remained at $0.60 per sq. ft. quarter-over-quarter, and up 7.1% from $0.56 year-over-year. 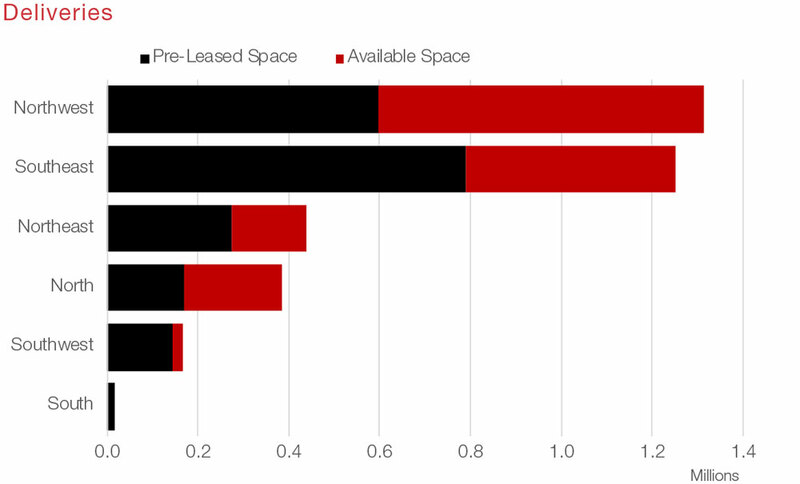 The monthly average rate for Flex space is currently at $0.78 per sq. ft.; Manufacturing rates are at $0.62; and Warehouse/Distribution space sits at $0.58. The Southeast submarket currently has the highest monthly overall average rate at $0.68 per sq. ft., followed by the Southwest submarket at $0.67.